How is LinkedIn better than Facebook, Google or YouTube? On YouTube, a keyword-targeted pre-roll ad might show the same video to a CEO and an intern. On Facebook, an ideal customer may log on to see photos of a new nephew, not to check out a 30-second demo of your SaaS product. You know much more about who’s on the other end of an ad. You have a pretty good idea of why they’re on LinkedIn—to improve their career or company. LinkedIn ads offer the benefits of video content and the granular targeting of a B2B-centric platform. They also come with higher costs and LinkedIn-specific platform limitations. Fundamentally, there’s nothing unique about a video for a LinkedIn ad. The same video content likely works well in other channels. But there are technical and strategic keys to smart deployment. Facebook, Twitter, and Snapchat have thus far dominated the market in video ad spend on social media. But LinkedIn owns the lucrative B2B audience. 72% of the Fortune 1000 are B2B companies. That means that there’s plenty of business to be won—even if LinkedIn views come at a higher cost (more later). LinkedIn suggests a wide spectrum of video types to accommodate various budgets. A sizable budget is perhaps most vital for LinkedIn ad spend. Stay on brand. Don’t copy the style of a popular video (especially a “viral” one) if you’re trying to drive home your unique value proposition or establish your brand. Plan it out. A one-minute video needs only about 150 words. You need a straight-to-the-point script and an agreed-upon storyboard for the accompanying shots. Amplify. 15s and 30s versions to grow reach and impact. Echo. A return to 6-second ads to reinforce the past message. The strategy, according to Google, improves ad recall (and, undoubtedly, YouTube revenues). The format isn’t directly applicable to LinkedIn, but there’s a broader takeaway. A successful campaign needs to break video messaging into chunks that can capture busy top-of-funnel scrollers (short videos) and more engaged middle- and bottom-of-funnel viewers (longer videos). Hook. Capture attention within the first 3 seconds. Ignite Pain/Pleasure. Identify problem or opportunity in 3–15 seconds range. 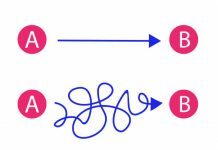 Describe Solution. Explain what you offer and why it will help viewers from 15–50 seconds. Call to Action. Leave them with an actionable next step in the final 10 seconds. Just as LinkedIn videos perform differently than YouTube pre-roll clips, they have unique technical and targeting requirements, too. 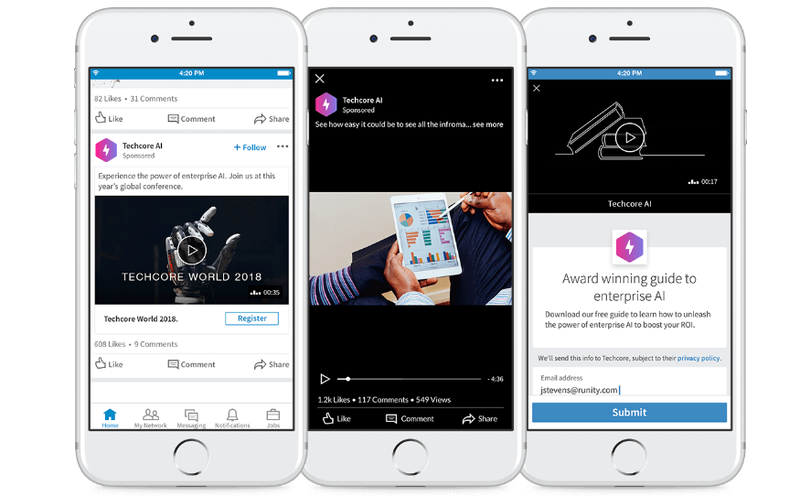 Native video ads appear within LinkedIn news feeds. Unlike YouTube pre-roll videos, the ads are less likely to appear as interruptions. These are the technical, targeting, and cost considerations for rolling out a LinkedIn video ads campaign. Sponsored Content campaign from content posted to your Company page. Direct Sponsored Content campaign with video not published elsewhere. The benefit of the latter is to deliver more targeted messages. Several versions of a video, for example, might target a segment of your customer base or be part of an account-based marketing strategy. Video length can range from 3 seconds to 30 minutes. Filesize must be between 75KB and 200 MB. File format must be MP4. Videos must have a horizontal layout. Frame rate must be less than 30 frames per second. By default, LinkedIn video ads play without sound. Hard-code subtitles to get your message across without the audio. LinkedIn’s targeting capabilities—by company name, job title, etc.—are a big reason why Linkedin has become a popular, if expensive, platform for B2B advertisers. If you’re new to LinkedIn targeting, you can find introductory guides here or here. LinkedIn targeting for video ads is no different than targeting for other Sponsored Content. Combinations (multiple characteristics) and exclusions (without certain characteristics) are both possible. Part of the reason why advertisers haven’t embraced it yet is we don’t have the ability to retarget video viewers yet. Once LinkedIn releases this functionality, I think it will be much easier to make the case for video ads on the platform. The inability to retarget video viewers doesn’t preclude lead generation. LinkedIn offers Lead Gen forms that overlay Sponsored Content, which removes the need for visitors to go to a separate landing page. At the same time, if video viewers never leave LinkedIn, they won’t generate hits to your site to allow you to track post-viewing behavior. Sales often take place offline. The sales cycle may last for months, or more than a year. Both are limitations on how much video metrics can tell you. 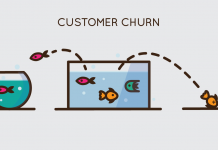 You’ll almost certainly endure gaps between LinkedIn behavior and the close of sales. Number of clicks to view the video in full-screen mode. LinkedIn advertising isn’t cheap. In case studies, LinkedIn touts cost-per-view metrics as low as $0.06, but, as Wilcox notes, that can add up quickly. Facebook cost-per-view metrics, for example, average around $0.02. A difference of $0.04 is a 3X price increase. The biggest mistake with LinkedIn video ads is to be testing video on LinkedIn first. The costs are 3–6X higher than video views on Facebook, so the most efficient use of your dollars is to test your creative on Facebook (or YouTube) first, and then bring over the creative that performed best. What works well for Sponsored Content videos on LinkedIn? There are five core use cases. “I haven’t seen truly great video ad campaigns yet,” Wilcox admitted. “The format is pretty new, so it’s still a bit of the wild, wild, west.” That hasn’t stopped some pioneering (and deep-pocketed) brands from venturing into unfamiliar territory. As noted earlier, LinkedIn video ads don’t require a wholly different approach to video marketing. The B2B video examples below were distributed on LinkedIn or other social channels, as well as YouTube. Know exactly who you want to reach. Know what you want those viewers to do. If you hit those targets, you’re more likely to get a strong return on ad spend, whether your goal is brand awareness, product trials, or another use case. The aforementioned LinkedIn survey suggests that “building brand awareness is the most common driver for investing in B2B video content.” In B2B, for better or worse, that often takes the form of quirky commercials from serious companies. There’s certainly a risk in the original becoming formulaic: every “boring” B2B company suddenly coming to life in video spots. 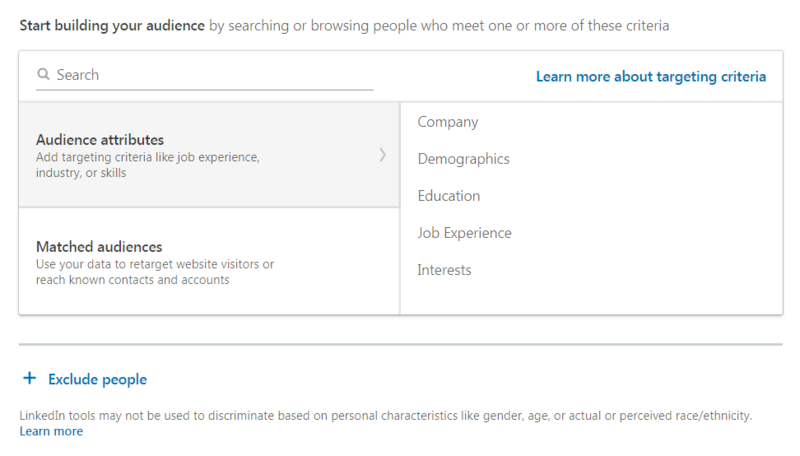 LinkedIn offers the chance to connect with customers—or potential employees. Its targeting allows recruiters to go after specific job titles or companies that are a potential match. The high price tag of LinkedIn video ads and robust targeting entice some to go further down the funnel with B2B video spots. It certainly helps if you partner with a highly regarded video production company, as Slack did in 2014. While the spot precedes LinkedIn video ads, it weaves a humorous narrative into a customer testimonial: targeting pain points, showcasing the product, and entertaining viewers. Video ads have obvious potential for the B2B SaaS world. It’s difficult (or uninteresting) to convey the functionality of a SaaS product via text or still images. At the same time, a formal video demo may not capture audience attention, especially at the top of the funnel. 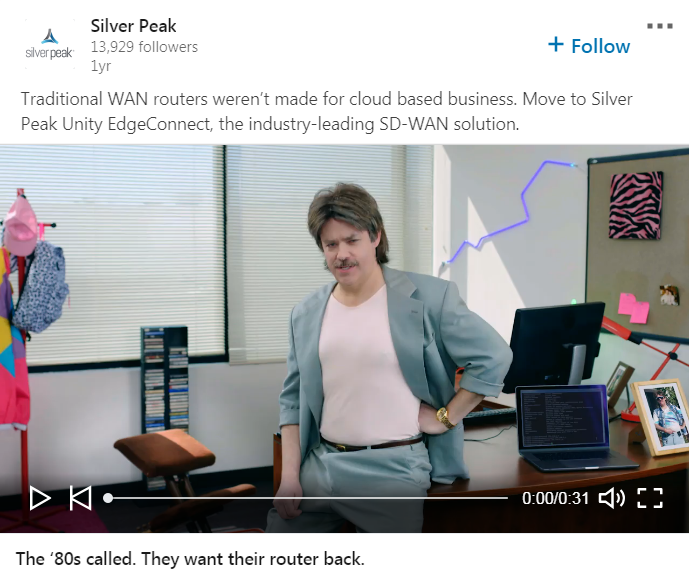 Silver Peak ran LinkedIn video ads for their SD-WAN platform. The spot was clever. Poking fun at 1980s styles likely resonated with the age demographic for their target audience. It also ended with a call to action to visit a microsite for the campaign. Posting video ads on LinkedIn has one more alluring potential: feedback from the target audience. Likes and comments offer qualitative feedback on the video content—a passive way to conduct market research on social media. That information is especially valuable if the video is used for YouTube pre-roll or TV spots, which don’t offer the benefit of viewer feedback. It’s not the primary benefit. LinkedIn is too expensive (though sponsored videos can generate organic views in addition to paid ones). But it adds potential value to the investment. Video is absolutely incredible at getting people to accelerate from the top to the bottom of the funnel rapidly. It might take several touches with guides and webinars to get someone to know, like, and trust your brand, but a well-produced video can do it in less than a minute. The potential is recognized but not yet realized. As more ad budgets shift toward video, LinkedIn video ads will be increasingly relevant. Added relevancy, however, is likely to continue to drive up costs that already outpace other channels. 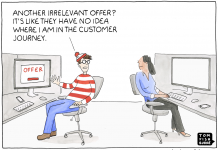 A retargeting capability may add more potential value to ad engagements. Still, a tested video strategy—one with engaging, relevant content and a clear call to action—offers the best chance for getting value from an investment in LinkedIn video ads. PS. 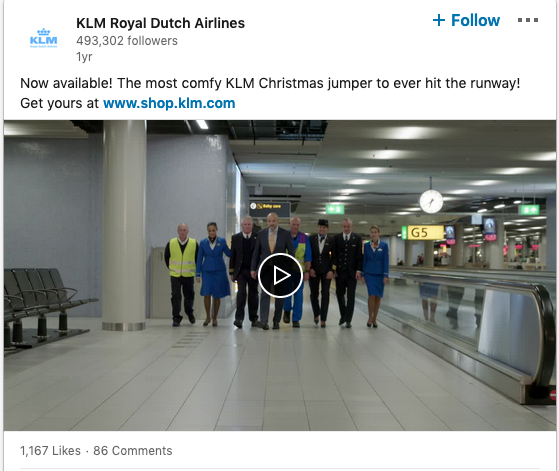 With video ads, aim for engagement. Benefit #1: you’ll get cheaper ads. Benefit #2: you’ll get invaluable feedback in comments which will help you with the next campaign, ad, or even product.